Curve fitting functions, for which the functions to be fitted may have any number of arguments. The Scipy statistics and distance functions have different optional arguments, depending on the statistic or distance metric being used. Pass a single range to Python, and extract the required arguments in Python code. Pass a single range to VBA, and extract the required arguments in VBA code, passing to Python as a single array. Use a VBA ParamArray argument to combine any number of VBA arguments into a single array which can be passed to Python. Use a single range or ParamArray to pass pairs of argument names and values to Python, where it can be easily converted to a dictionary. Use the xlwings Dictionary converter, that turns a 2 column range into Python dictionary format. The advantages and disadvantages of these methods are discussed below, with examples in the spreadsheet PassParamarray.xlsb and associated Python code, which can be downloaded from PassParamarray.zip. In the examples below data is passed to Python functions in various formats. The functions return two columns with the value of each argument (or the value of the first element in the case of an array), and the argument data type. In the first three examples the data is passed to VBA as a single column or row. In the first two cases this array is passed directly to the Python function. 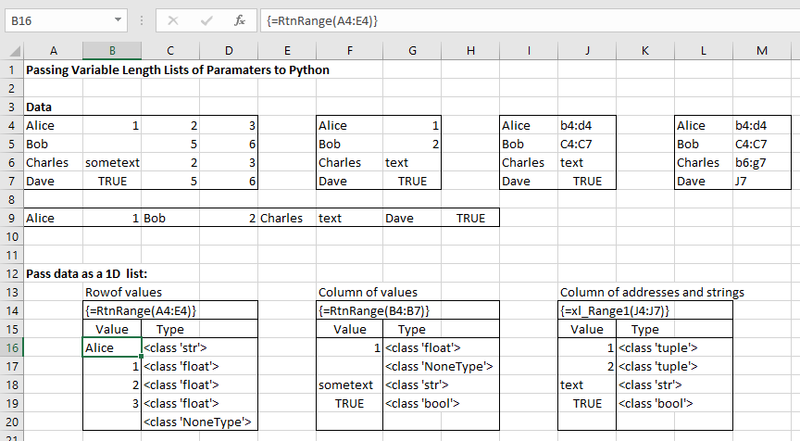 In the third any text defining a spreadsheet range is converted to a variant array, before being passed to Python. The xlwParamA function (first two examples above) converts each element of the ParamArray to an array of values. 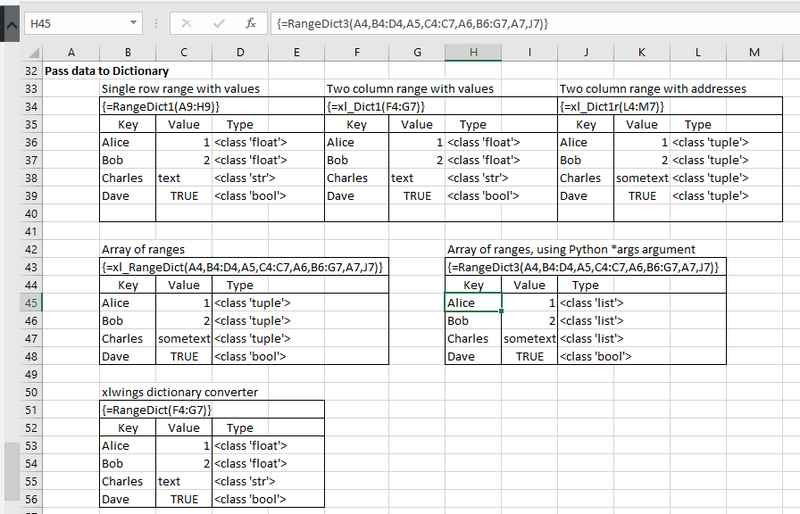 The first three examples above are similar to the earlier single column examples, except with the addition of data for the dictionary keys (see the download file for VBA and Python code). This entry was posted in Arrays, Excel, Link to Python, NumPy and SciPy, UDFs, VBA, xlwings and tagged dictionaries, Excel, ParamArray, Passing arrays, Passing named arguments, Python, UDFs, VBA, xlwings. Bookmark the permalink. Now you can call it from Excel as xl_brentq(f,a,b,,,50) and it will work: the wrapper function is building the call to scipy.optimize.brentq using only arguments different from None; xtol and rtol are not given, and so scipy.optimize.brentq will use its defaults. In other words, the wrapper is building the right dictionary for us. In the case given in your example, I agree that using optional arguments in Python is now the easiest way to go, since xlwings will now generate the required optional arguments in the VBA UDF, and generate the correct input for the Python function. to call Python functions that have a variable number of optional arguments, or to use a single VBA function to call a large number of different Python functions, which may have different numbers of required and optional arguments. An example of the latter is calling the Scipy statistics functions (see https://newtonexcelbach.com/2018/07/10/scipy-statistics-functions-coding-and-getting-help/ for details). Another use is when the Python function has a large number of optional arguments, which is the case for many Scipy functions. This procedure allows the optional arguments to be passed as kwargs, rather than having to define them all as optional arguments in the wrapper function.